"I think that the jury system may lead to a high average, but in art what we want is certainty that the one spark of original genius shall not be extinguished." This gorgeous and affecting 56-minute documentary outlines the life and work of a unique and determined woman who has been called "the first American Impressionist." Produced by WETA for broadcast in 2002, and based upon a recent Art Institute of Chicago show of Cassatt's work, this DVD release makes it possible to revisit the richness of her life and works at leisure. Mary Cassatt was born in 1844 into a prosperous family living near Pittsburgh. After a four-year family "grand tour" of Europe, Cassatt returned to Pennsylvania and announced—at age 11—that she intended to be an artist. She began studies in Philadelphia at age 15, and when finished there, began the first of several extended sojourns to Europe. Traveling with her mother or studying with friends, she began the long effort to become established in an art world highly dominated by men. She focused on the art traditions of Europe, and was determined to immerse herself in its treasures, as well as the greater freedom afforded women on the Continent. Cassatt established a home in Paris with her sister, and eventually was accepted many times by the established Salon, but her heart was leading her in the less formal direction of the Impressionist painters, such as Claude Monet and Edgar Degas, who were just then becoming known for their new approach to art. The remaining life story here describes how Cassatt balanced her independent spirit with artistic triumphs, and manages to keep a strong connection to her family as well. There are high points and low points, and the story of how she confronts her personal losses is skillfully blended with how she views her art. It is quite emotionally powerful to hear a person who has reached the pinnacle of success discuss the meaning of it all, and whether she made the right choices in life. Tissues recommended. In typical documentary photomontage manner, there are many contemporary photographs drawing us into the world that Cassatt inhabited, as well as her own paintings and prints as well as some by other artists who influenced her. This is a fascinating weaving of one talented life into the fabric of history as she lived it. The Civil War prevented her from sailing to Europe for several years, and the Great Chicago Fire of 1871 destroyed several of her favorite paintings, which she had sent there for exhibition. Another time, she was literally chased out of Europe by the outbreak of the Franco-Prussian war. Expert interviews are provided by curator Warren Adelson; Dr. Judith Barter, curator of American Art at the Art Institute of Chicago, and Nancy Mowll Mathews of Williams College. 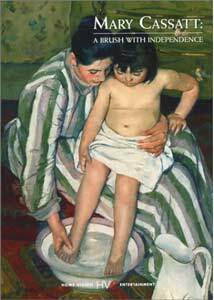 All three provide useful background commentary and perspective on Cassatt's work. In addition to the still images are excerpts of letters written by Cassatt and her friends, providing an intimate glimpse into the small and select world of independent and artistic women of the late 1800s. There are at least 50 individual art works by Cassatt that are shown in this film, including her less often seen copperplate aquatints. The color reproduction is beautifully saturated and very rich. The works are highlighted in varied ways, from detailed ribbons to flowers to children's rosy cheeks and so on. We sometimes see magnified individual brush strokes, sometimes the entire artwork, details of ornate frames and even the color of wall it is displayed on. The production values of this DVD are excellent. Archival material from at least 15 sources (public, private, and international) and art works from 23 sources (museums, galleries, and private collections) have been used to create a unique document of Cassatt's art and personality in time and place. Image Transfer Review: Although shot in high definition, this program is presented in nonanamorphic widescreen format. The interview segments as a result frequently have significant aliasing. However, the artwork itself is beautifully rendered. The camera often lingers on close detail of Cassatt's paintings, allowing one to see the confident and suggestive brushwork that was her trademark. Color is excellent for the most part; black levels are somewhat weak in the interview segments but the paintings themselves are fine. Audio Transfer Review: A 2.0 audio track is quite clean and free of noise and hiss. Anne Archer's narration is center-oriented, but the Impressionistic piano accompaniment by Jacqueline Schwab fills all speakers. The resulting soundstage is pleasing and appropriate for the subject matter. Extras Review: The sole extra is a brief set of production notes contained in the flyer. Chaptering is thorough. This documentary is intense and beautiful. While it presents the full range typical of any individual's happiest and saddest moments in life, it also includes the triumphs and challenges of a highly talented artist who perseveres. Cassatt's is a timeless story that also incorporates a miniature history lesson of the period 1850 to 1926 and its political, social, and artistic context.